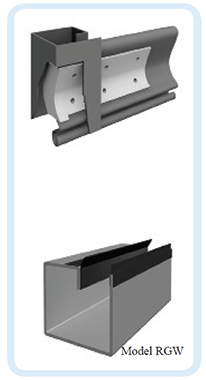 ROLLC Wind Lock Mechanism Shutter consist of interlocking curved profile slats up to 1.2mm. thick, produced from galvanized, Steel with Wind Lock System Furnished on alternate Slats to withstand 85 m.p.h. The bottom rail is double steel angle 50mm x 50mm x 3mm x 3mm.A rubber bottom rail weather seal is included as standard equipment. Wind Lock Guide Model RA 75 or model RGW 75 designed to resist high wind pressure. The top of guides is flared outwards and flanges welded for ease of curtain entry into the channels. Shaft of specific size is designed to give a high factor of operating safety and minimum deflection. 5mm thick steel brackets with bearing , bolted to the guide wall extension which supports barrel and forms end closures. Push-up, hand chain or motor operation. (for optional features see motor operator section in this catalog).